My name is Keiley (pronounced Key-Lee), but I’ve gone by Keebles or Keebs since I was a kid, so I’ll answer to anything in that ballpark. I was born, raised and will probably die in Northeast Arkansas. I’ve been divorced for so long that I’m not sure it even counts anymore. I have two beautiful rescue Shih-Tzu’s...Bam and Bugs who are my whole world. And I guess the biggest elephant in the room is that I’m an Asper with OCD, so a lot of routine things in life are difficult for me, but since I’m old and grew up in a time when you either hid your problems or learned to adapt, I have basically done both my entire life and can function pretty well in the day to day...or at least enough to appear normal enough to the outside world. I was pretty young when I started stitching probably 8 or 9. My step-grandmother tried to teach me to crochet first (which didn’t take) and then she tried knitting (which also failed). My mother used to embroidery, but I never could understand all the different kinds of stitching, so again...fail. Cross stitching was last on the list and I took to it like a duck to water and I’ve been stitching off and on ever since. Aspers tend to get bored very quickly, but we can also become completely obsessed with something so much that it lasts a lifetime. My three lifetime obsessions are cross stitching, Disney and Duran Duran although the order does tend to vary. On the OCD front, what could be better than the repetition and symmetry that stitching offers. I started blogging almost 6 years ago partly out of frustration from social media (I HATED Facebook and the like). I met a fellow Duranie/Disney person who blogged and showed me the ropes and, after I got comfortable, all my social media accounts went out the window and I’ve never looked back. Granted, lack of a social presence does isolate me a bit even in the stitchy world, but the Asper in me kind of likes that. We aren’t social creatures by nature and we are quite selfish as well...I could not have cared less what others were doing, let alone feel obligated to comment every time so-and-so’s kid burped. The blog world is SOOO much better and I’m more in my element, surrounded by more like-minded people. I don’t blog to gain followers, but rather to have a venting place just for me, hence Keebles World. I can do a post, rant about whatever, and I don’t expect others to comment (although I’m always pleasantly surprised when people do...why anyone would want to read some of the crap I post is beyond me, especially when I’m having a serious Asper-rant). I think the hardest part about blogging (at least for me), is trying to keep up with everyone else’s blogs. I was definitely a OAAT until I started blogging and, even then, it was a few years before I started with rotations. Now I have technically 9 projects in rotation (although only 6 are actually rotated and the other three ignored for various reasons). I am EXTREMELY organized...it goes with the OCD territory, although I am a bit lax when it comes to rotation schedules (that’s all Asper). I do like to change projects when I feel like it versus on a specific day (although I try to switch out week to week), but I tend to routinely report my weekly progress on Sunday nights. I stitch two-handed thanks to scroll rods and lap stands and, since I have no life outside of work, I can easily manage 40+ hours a week stitching on average (at least half of that is weekend time), so I do tend to make a lot of progress per week although I’m not necessarily a fast stitcher. I utilize both paper patterns and my iPad in the process, I take photos of my progress every night and I keep track of my time via a time clock app (that’s a fairly recent development). My OCD will not allow me to use the parking method and I will often get hives just seeing pictures of other people’s parking. All those loose threads hanging everywhere...chaos! Throughout my youth, I only did kits and really had no knowledge of anything else (although I’ve subscribed to cross stitch magazines periodically throughout the years). Only when I became a blogger and got to know other stitches did I started to learn more about stitching techniques and digital patterns which lead me to Heaven and Earth Designs. I immediately fell in love with Jasmine Becket-Griffith’s work and have quite the stash of not only her designs, but several other artists as well. And don’t get me started on the joy that is Etsy! Since I’m a Disney girl through-and-through, most of my stash tends to be of the Disney variety or of a similar ilk. Since Jasmine also does work for Disney, I have several of her prints and basically have an entire JBG wall in my house which will only grow with time. I don’t like dithered patterns (as I have mentioned once or twice or a hundred times on my blog). Now that HAED has gone 100% dithered, it has negatively affected the number of patterns I buy, especially JBG designs, but I do still buy them if it’s just a design I can’t live without. I’d have to say my first HAED (which is a JBG), The Highland Girl. It was the largest project I had ever done at the time and I’m still in awe of it. Although, the most difficult piece I ever did, the typical stitcher’s rite of passage, Teresa Wentzler The Castle, took me from high school to college to college dropout, then to marriage to divorce, and back to college and dropout again before it got finished, so I guess there is something to be said for that and it holds a lot of memories (as well as stains). HAEDs have spoiled me because I HATE half and quarter stitches, backstitching, and most certainly French knots! My OCD loves a whole project with all the same kind of stitches lined up all nice and neat (although the backside of my projects are atrocious and I can’t see that ever changing). My poor Mickey and Friends. It was an old kit I bought off of eBay back in the day and the material was sucky to begin with. It sat in my stash for years before I started it, so the fabric didn’t age well. Somehow or other, I managed to put my hand right through the fabric creating a huge hole/tear and I ended up patching it with a cutout piece of fabric put on top and stitching over it all. You can’t really tell other than it’s a bit lumpy in that area, but I’ll always know and it drives me insane every single time I look at it. Also, most of the symbols were so similar that I ended up doing most of Donald’s face in the wrong color and, by the time I realized it, it was too late to fix it. He’s got a pink tint to him (and pink is my absolute least favorite color), which is another sore spot for me. Unfortunately, it was during pre-digital age and I used to mark off the completed stitches on the paper with a marker basically destroying the pattern. On top of that, when I finished a project, it was a big deal for me to trash the pattern and the leftover thread as a sort of send-off to the project, so I don’t have the original pattern to redo it. Now, I make copies of paper patterns and keep the original digital copy (if there is one), but I do still trash the working pattern like I always have. I don’t get rid of the old thread anymore though, I save it for a rainy day. A Patch in Time Saves the Project? I always wanted to learn to quilt, but I can’t sew (long story involving my refusal to take home-ec even though my mother tried to force me to every single year of high school). I had this amazing quilt when I was a kid (a Sunbonnet Sue one although it had this hideous yellow ochre backround), and it got ruined when I moved to live with my dad (which also got ruined, but that’s a whole other story). I always wanted to remake that quilt in shades of purple (of course), but alas, it’s probably never meant to be. Quite a few years ago my mother bought me a sewing machine and all kinds of quilting stuff for Christmas, but again, I can’t sew, so the machine sat in my closet for several years still in the box until I lent it to a friend and I haven’t seen it since. Besides, I’m not sure I have the patience or the skill-set to quilt. I’m not a crafty person by nature and all the different mix of fabrics needed for quilting doesn’t play well with my OCD mentality. If I have instructions and a specific task, I do well, but I’m horrible at trying to be creative. Even when I was an art major in college, I did better drawing or painting something in front of me or copying something else versus coming up with my own ideas. I used to have a drawer of them, but I finally got almost all of them matted and framed. I like the typical black mat and black frame and, because I’m poor, I can’t get too fancy with it anyway. I used to mat and frame them myself, but the older I get, the harder it is for me to cut straight and I’ve gotten lazy and it’s just easier to pay Hobby Lobby to do it. Plus, digital charts tend not to be the standard size, so they need custom frames anyway. In my early years, I did a lot of projects for other people, especially for the birth of a child or marriage, but it seemed like people got less and less appreciative over the years. Designs I worked so hard on got put in attics or trashed and I hated it. Over time, people tend to move on or forget things...we Aspers dwell forever and we NEVER forget. I still have and cherish the projects I did when I was just a wee one and it’s hard for me to comprehend that others don’t think like I do. I would say again, Highland Girl (because I have strong Scottish blood) and Princess and the Pea (because I am incredibly sensitive to sensations and have been accused of having Princess and the Pea syndrome anyway). Every pattern or kit I buy has to be "me " or has elements of my taste in it or it won’t hold my attention long enough to finish it. I’m not sure I have any secrets...I’m pretty open on my blog and often talk about things I probably shouldn’t...from work to family to personal stuff. I am the I.T. Systems Admin for a pathology lab by day, live in a trailer filled to the brim with Disney memorabilia by night and rarely venture out of those two realms. There is a part of me that really wants to start doing FlossTube, but that will have to wait until I build my house and I have a well-lit craft room. I also plan to do time-lapse videos of my stitches that I’ve done since I started taking pictures, but I have issues with the lack of symmetry of the pics and need to find a good stacking program first (something I’ve been trying to do for a couple of years). When it comes to jokes, my Asper brain can’t process them quickly enough to get the punch line, so I typically avoid telling them or even listening to them. Thanks so much Jo for doing this! What a great idea and I’m learning so much about my fellow bloggie friends! So nice meeting you! I have some pupils with Asperger's at school. Reading all about you really gives me much info on the idiosyncrasy of people with Asperger's.So much excellent work!AriadnefromGreece! Ah, Duran Duran. Who's your favorite? Mine is Roger. Great to see all your project Keebles! I enjoy your blog and your rants about dithering. Great answers and nice to see some of the older finishes too! What a fun and interesting post Keiley. It was so nice to learn more about you. I have been following your blog for months now. I really enjoyed seeing your project wall. Its beautiful. I am a fan of Duran Duran from my youth. But not as big a fan as you. Nice to learn more about the woman behind the blog. 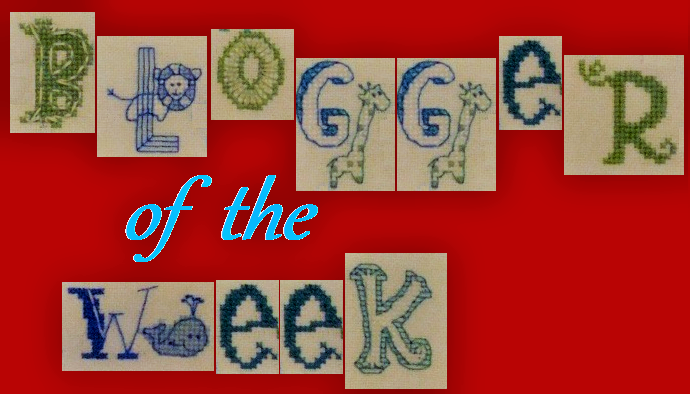 I have enjoyed reading your blogger of the week answers Keiley and seeing pictures of your lovely stitching. Very nice to meet you, Keiley. It was very interesting to read your answers. I particularly loved to see the picture of your JBG wall. And TW's Castle is very impressive. Another great blogger of the week! Your Highland Girl is absolutely beautiful. Nice to see Princess and the Pea again too, and learn more of your thoughts about stitching. Very nice to meet you Keiley! Oh my goodness, I just LOVE your Princess and the Pea! It is gorgeous, but then all your stitching is gorgeous. I did a search and found your blog and signed up to be a follower; I look forward to seeing more of your beautiful works of art!! Hi Keiley, Oh, I so enjoyed reading your blog post - so wonderful to learn more about you and your stitching. I, too, love your Princess and the Pea finish - truly lovely. And thanks to Jo, you've gotten another follower! So nice to meet you and learn about you. Your stitching is lovely. I love all your JBG's, the wall looks great. And DD - John's my favourite! Hey Girl!!!! Happy to see you here!! !